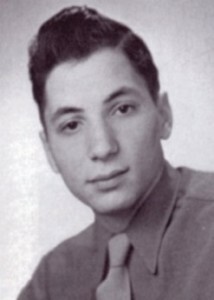 Nineteen-year-old William “Tsak” Tsakanikas was the 4th of ten children of Greek immigrants living in White Plains, NY. Transferred from the ASTP, he had joined the Intelligence and Reconnaissance platoon of the 394th Infantry as runner. The I&R platoon, led by a twenty-year old Missourian, First Lieutenant Lyle J. Bouck, Jr, was about to enter history as the most decorated platoon of WWII. In December 1944, the eighteen man platoon was in position on the extreme right (south) flank of the 99th Division. They were the ears and eyes of the regiment. Bouck’s soldiers occupied a wooded knoll northwest of Lanzerath, Belgium, where they observed a large open area known as “the Losheim Gap”. To the east, the gap led into Germany and the defenses of the Siegfried line. The gap also extended four miles to the south, becoming a series of rolling hills extending to a high wooded plateau known as the Schnee Eifel (Schneifel). The latter was held by the 106th Division but the gap itself was only occupied by a cavalry group. Though small and seemingly insignificant, the village of Lanzerath was vital for the German planners of the I. SS Panzerkorps. The road going through the village was Rollbahn D on their battle map, the attack route for the Kampfgruppe Peiper. In the early morning of December 16, 1944, the leading elements of 3rd Fallschirmjäger (Parachute) Division had to size the village and open the road to the west for the tank column of SS Lt Col Peiper. Lt Bouck’s platoon will stand on their way and hold a battalion of German paratroopers for nearly eight hours, repulsing assaults, wave after wave, inflicting tremendous losses among the attackers. At the end of the afternoon, without support, out of ammunition, the I&R platoon was finally overrun and surrendered. Their heroic resistance bought enough time for rear units to reorganize and hold in place. « … just as it was getting dark, they started their main attack … and all hell broke loose. Sgt Slape jumped on the .50 caliber and opened up and we were all firing. I do know if they got Slape but the cal.50 was silenced. “Pfc William James Tsakanikas distinguished himself by extraordinary heroism against armed enemy forces at Lanzerath, Belgium, on December 16, 1944, while serving with the I&R platoon of the 394th Infantry Regiment, 99th Division. Following a relentless early morning artillery barrage, Pfc Tsakanikas courageously volunteered to probe the enemy area to gather intelligence information. Returning later to the platoon position, he reported small arms fire nearby. Knowing an enemy attack was imminent, he moved with daring boldness to the most forward foxhole position. Soon two columns of German paratroopers were sighted marching on the road through Lanzerath about 200 yards from his position. Pfc Tsakanikas fearlessly engaged the enemy with devastating small arms fire inflicting many casualties. Throughout the day, he fired his weapon point-blank at the enemy and helped repel three separate frontal attacks despite being outnumbered fifteen to one. On the second attack, Pfc Tsakanikas left his foxhole and boldly manned an exposed .50 cal machine gun where he increased the hail of fire on the advancing enemy. As the third frontal attack began, he ran in the face of withering fire to a forward position where he placed effective point-blank “grease gun” fire on the enemy. During the fourth and final attack, Pfc Tsakanikas emptied his last rounds of ammunition at the enemy soldiers attacking from the rear. As he prepared to escape from the encirclement, a burst of automatic fire ripped through the right side of his face with the impact slamming him to the bottom of the foxhole where he was captured at gun point. (extract of the Distinguished Service Cross citation – GO n° 26 – 29 October 1981). 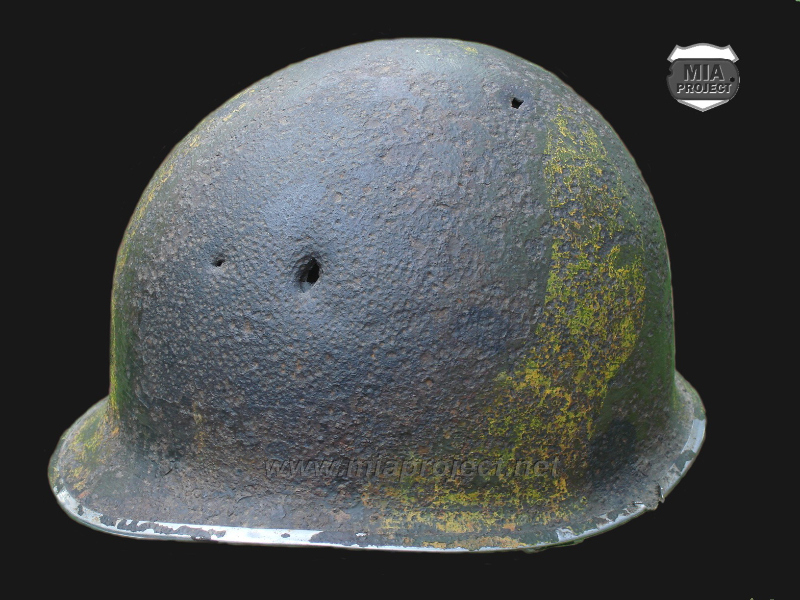 Tsakanikas’ helmet, note the battle damage on the right side and the stainless steel rim riped out by German bullets. 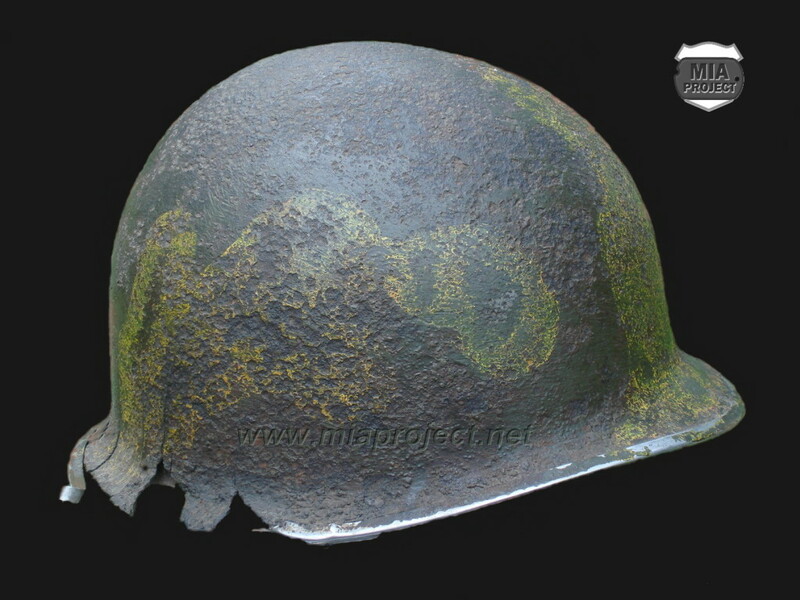 The helmet retains most of its yellow camo paint (vesicant reactive paint), frequent among 99th Division units that participated in the Louisiana manoeuvers in the spring of 1944. After William Tsakanikas’ brutal capture, his helmet remained in the foxhole until it was discovered in 1982. “Tsak” had survived the war but his severe injuries drove him through 36 operations of facial reconstruction. After the war, he changed his name for William James and passed away on June 22, 1977 at age fifty-two. 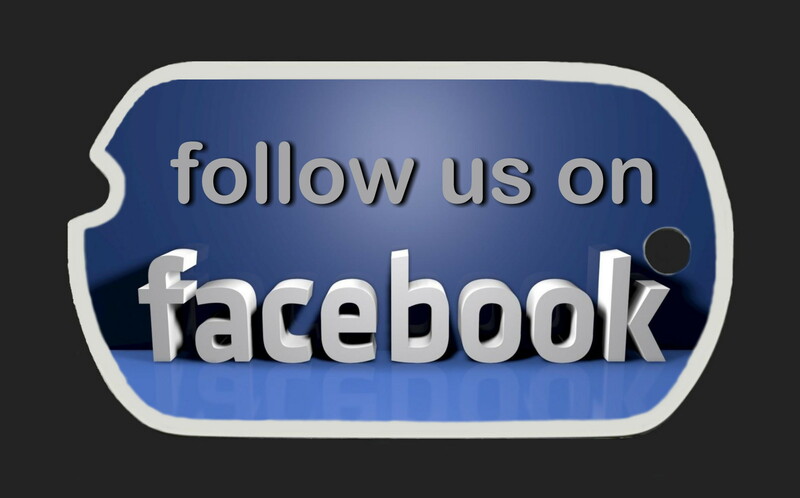 The helmet is a camouflaged McCord mid war production with a Hood Rubber low pressure plastic helmet liner. 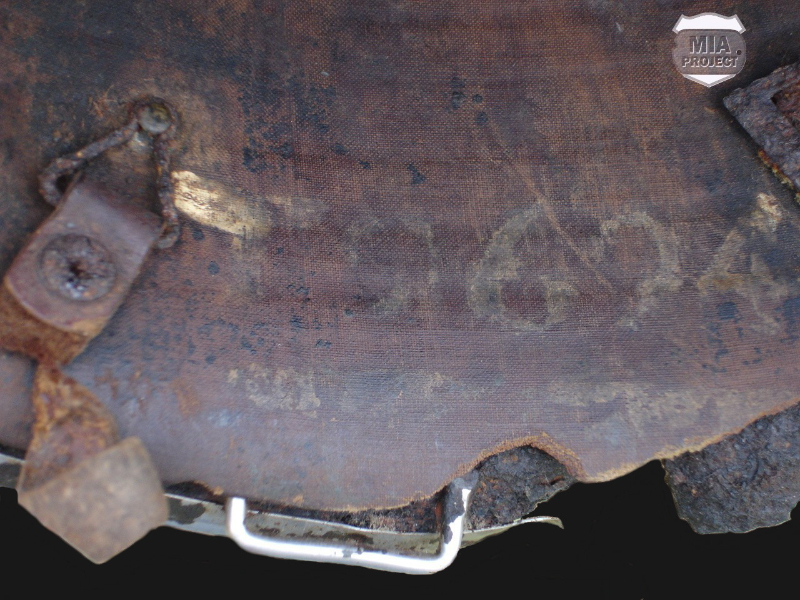 It bears a laundry marking (T-9694) identifying its original owner: William Tsakanikas 12219694.